2016 has proven to be a record breaking year at Ireland West Airport with passenger numbers exceeding 730,000 for the first time in the airports 31 year history. In 2016, the annual number of passengers using the airport increased by 7% to 734,031, an increase of 48,563 passengers compared to 2015. 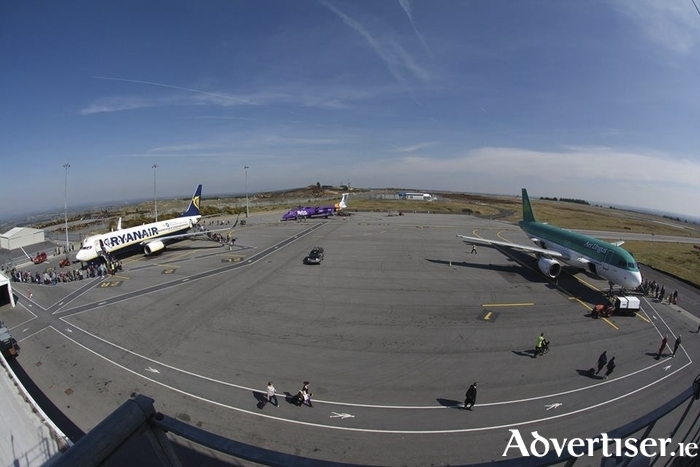 The Airport now serves 23 International destinations and is served by three of Europes major International airlines, Aer Lingus, Flybe and Ryanair. The growth in passenger numbers in 2016 was fuelled by the commencement of four new services to Birmingham and Edinburgh with Flybe, Costa Dorada with Falcon & Thomson Holidays and the arrival of the first ever charter service from Boston with Aer Lingus. Extra capacity on existing services from Barcelona, Bristol, Faro and Manchester also helped drive passenger numbers to record levels in 2016. The UK Market saw the biggest increase in 2016 with an extra 55,000 passengers using UK services to and from the airport which represented a 10% increase on 2015 numbers. The Airport now serves 9 different airports across the UK which represents the biggest selection of UK services to and from the West and North West of Ireland. The strong increases on UK services highlights the importance of the Airport from a regional perspective in providing essential connectivity for leisure, tourist and business passengers. In 2016 campaigns in excess of €200,000 took place in the UK with Tourism Ireland, promoting access to the West and North West of Ireland whilst a €500,000 advertising campaign headed by Fáilte Ireland in partnership with five local authorities in Mayo, Donegal, Sligo and Galway (City and County ) and Tourism Ireland started this week promoting the airport as the Western gateway to the Wild Atlantic Way from key markets in Edinburgh, Liverpool and Manchester. 2016 proved to be a very eventful year as the airport celebrated a number of milestones, including celebrating the 30th anniversary of the official opening of the airport, a special visit by US Vice President Joe Biden and the airports first ever runway run for charity which saw 1,500 participants take to the famous runway for a 5km run. In addition the airport welcomed its 10 millionth passenger through the airport in July 2016 and towards the end of the year the airport was the focus of a six part UTV Ireland documentary which was watched by over 1.5 million viewers. In addition in 2016 the airport welcomed an investment by 7 Local Authorities for an equity shareholding into the airport which has seen the formation of a unique and positive collaboration with local government in the areas of tourism, economic development and Diaspora engagement. 2017 plans to be another exciting year at the airport with the roll out of a number of major projects to enhance and develop the airports facilities to ensure the airport continues to offer an excellent and efficient product to our passengers and airline customers as traffic increases. In May the airport, in partnership with Knock Shrine and Joe Walsh Tours, welcomes a historic charter departing for New York with Aer Lingus which will see the remains of John Curry, the youngest person to witness the Knock Apparition of 1879, re-interred from the current location at Pine Lawn Cemetery, Long Island to St. Patrick’s old Cathedral, New York.